Radon – What’s the harm? Radon detection is a simple process, yet many householders in Ireland have not had their homes tested for this deadly gas. Indoor radon inhalation kills more people in Ireland each year than carbon monoxide poisoning, fires and road accidents combined. It accounts for approximately 13% of all lung cancer deaths in Ireland (250 deaths yearly). This means one person in Ireland dies every two days from radon related lung cancer. 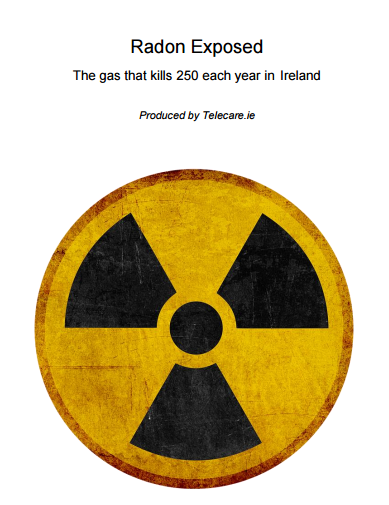 Since 2010, some 1,700 people in Ireland have died from this deadly gas. 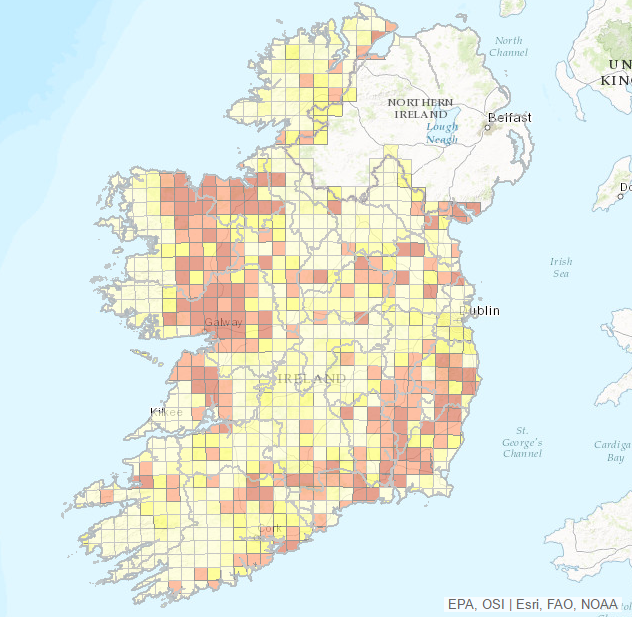 Approximately one-third of Ireland is designated as a ‘High Radon Area’. Yet it is estimated that to date, only around 8% of Irish homes predicted to have radon problems have been identified (less than one in ten). The good news is that radon is easy to measure by using inexpensive home-testing radon detection kits. If you do find that radon levels in your home are high, well-tested, cost-efficient methods also exist for reducing radon in buildings. Radon is a radioactive gas which you cannot see or smell. It comes from minute amounts of uranium that occur naturally in the ground in all rocks and soils. Radon can be found anywhere, but outdoors it quickly dilutes to harmless concentrations. It’s only when it enters an enclosed space, such as your home, that it can accumulate to levels which are harmful. Radon can accumulate under the slabs and foundations of a building. It can then enter living areas, mainly through construction cracks or gaps around pipes or cables. It can be found in any indoor environment, including homes, schools, and workplaces. Because radon enters from the rocks and soil beneath your home, radon levels are usually higher in downstairs rooms or cellars. Concentrations vary from house to house. Just because your neighbour’s home has tested safe for the gas, doesn’t mean yours will, even if your homes are adjacent to one and another. The concentration of radon in a home depends on a number of factors including where the house is located, its construction and the ventilation habits of those who live there. The Environmental Protection Agency (EPA) in Ireland, recommends that all householders have their homes tested for radon. Testing is the only way to know if dangerous levels of the gas are present. Just like asbestos and tobacco, there is evidence of a link between exposure to radon and lung cancer. When you spend time around radon, the part of your body that receives the highest dose of radiation is the bronchial epithelium. 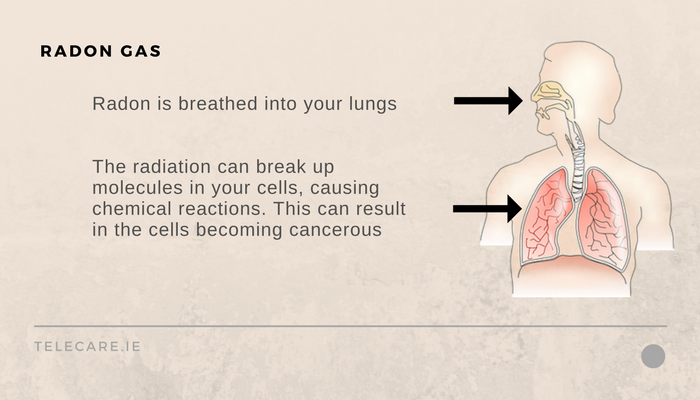 Too much of this radiation can induce lung cancer. The risk depends on the level of radon present and the time you have been exposed. The absolute risk to smokers and recent ex-smokers is much greater than to lifelong non-smokers. For an average smoker, the radon risk is 25 times greater than for an individual who has never smoked. For those having stopped smoking, the radon-related risks are substantially lower than for those who continue to smoke, but they remain considerably higher than the risks for lifelong non-smokers. How big of a problem is Radon in Ireland? “This prediction is based on the housing statistics in 2000. Given the large increase in the number of housing units in recent years, it is likely that even more homes now have radon concentrations above the Reference Level. This means that over 255,000 people may be living in homes with high radon concentrations, assuming an average of 2.81 people per household” (RPII/HSE Joint Position Statement, Radon Gas in Ireland, 2010). Radon is measured in becquerel per cubic metre (Bq/m3). The Reference Level for homes in Ireland is 200 Bq/m3. The Reference Level represents a radon concentration above which action to reduce radon levels is likely to be needed. However, according to the World Health Organisation, protective measures may be appropriate below this level. The worldwide average indoor radon concentration has been estimated at 39 Becquerel per cubic metre (Bq/m3). In Ireland, the average indoor radon level is 89 (Bq/m3). 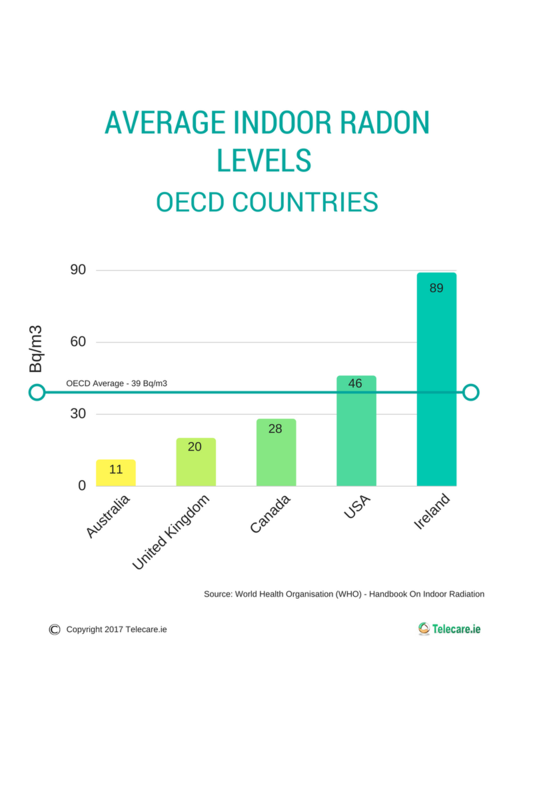 That makes indoor radon levels in Ireland the eighth highest among 29 OECD countries. That’s over eight times of Australia, four times that of the United Kingdom and around twice that of Canada and the United States. According to Ireland’s Environment Protection Agency (EPA), a lifetime exposure to radon in the home (i.e. 70 years) at the Reference Level of 200 Bq/m3, carries a risk of about 1 in 50 of contracting fatal lung cancer. And for every extra 100 Bq/m3 of radon exposure in the home, your risk of lung cancer increases by approximately 16%. Approximately one-third of Ireland, mainly in the west and the south-east, is designated as a High Radon Area (i.e. one where 10% or more of homes are predicted to have radon concentrations above the acceptable level of 200 Bq/m3). It is estimated that to date, less than one in ten homes in Ireland predicted to have radon problems, has been identified. This means many Irish people are living in houses with high radon levels, completely unaware of the problem. Some of the highest indoor radon concentrations, identified anywhere in Europe, are in Ireland. The most dramatic reading recorded in a house in Ireland to date is 49,000 Bq/m3. This was recorded in a home in Kerry, in 2003 and is one of the highest concentrations of the cancer-causing radioactive gas radon ever found in Europe. It is almost 250 times higher than the national reference level of 200 Bq/m3. Residents of a house in County Wicklow were exposed to ongoing radiation doses of 16,438, more than 80 times the national acceptable level. This was equivalent to the resident having 56 chest X-rays every single day over the time they had lived there, or over 20,000 chest X-rays per year. One in six homes surveyed in Co Wicklow showed higher than safe levels of radon. 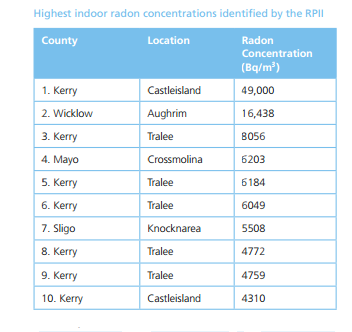 The Radiological Protection Institute of Ireland (RPII) in 2013, reported that they had identified a home in Ballymoe, North Galway, with 21 times the acceptable level of the cancer causing gas, radon. This was the highest level of radon found in a home in Galway to date. The occupants were receiving a radiation dose equivalent to more than 5000 chest X-rays per year. The home with the highest levels of radon to date in Clare was measured near Lisdoonvarna at 3,500 Bq/m3. Almost 18 times the Reference Level. The radiation dose received by the occupants of this house would have been equivalent to receiving 12 chest X-rays every day, over 4000 chest X-rays per year. The EPA publishes an interactive radon map to allow you to find out if you live in a High Radon Area. A High Radon Area is any area where it is predicted that 10 per cent or more of homes will exceed the Reference Level of 200 Bq/m3. However, just because your home is located in a High Radon Area, it does not necessarily mean that it has high radon levels. Likewise, while homes with high radon concentrations are more likely to be found in High Radon Areas, high concentrations can be found in homes in any part of the country. This is why the EPA recommends that all householders should test for radon. The EPA’s radon map is reproduced below. Any area that is coloured light or dark brown on the map is a High Radon Area. Radon testing can easily be carried out using a radon detector. Investing in a radon testing kit will give you an accurate representation of the radon levels in your home or other building. You will then know whether you need to take action to reduce the levels. The EPA provides a radon measurement service, as do several private companies including TASK Community Care. Rates for different testers vary. EPA testing is carried out by placing two small radon detectors in your home for 3 months. A 3 month measurement period is recommended because radon levels in a house can vary considerably from day to day. At the end of this period, you send the radon detectors back to the EPA’s testing lab for processing. The EPA states that their radon measurement service is confidential. 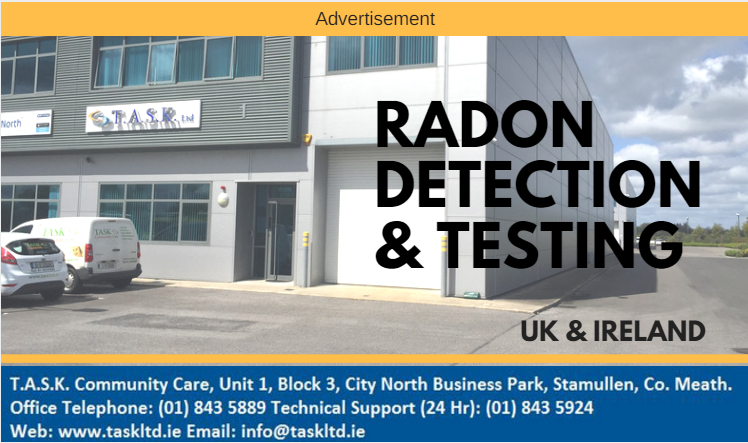 However, if you prefer to purchase a radon detector, which will give you readings at home (without having to send it off to a lab for results) please contact TASK Community Care (www.taskltd.ie) for further details. Another benefit of purchasing your radon detector privately is that it can be lent to other family members or friends, so they too can test for radon in their homes (i.e. once you have tested for three months or more and are satisfied that the radon levels in your home are safe). What can be done to reduce high radon concentrations in a home? If high radon levels are detected, in most cases they can be reduced relatively inexpensively and usually without disruption to the household. The EPA recommends that you should consider taking action to reduce the level of radon in your home, if the measurement is above the national reference level. This is known as ‘radon remediation’. The remediation work could involve preventing radon entering your home from the ground or by removing the radon after it has entered your home. 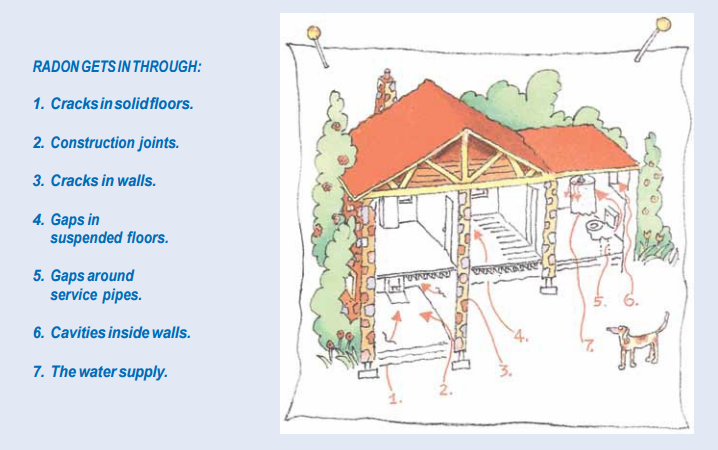 A booklet produced by the Radiological Protection Institute of Ireland, entitled Understanding Radon Remediation – A Householder’s Guide contains information about the solutions available for removal of radon from your home.